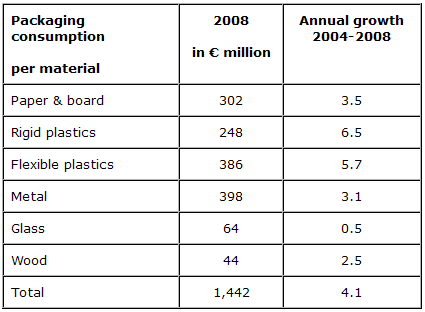 In the last five years the Greek packaging industry had an average growth of 4%, much above the European Union average. 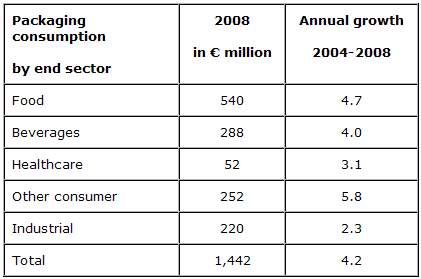 Food and beverage is the major customer sector covering more than 55% of packaging consumption. The expected growth figure for 2009 is 1-1.5%. The Greek packaging manufacturers are being affected by competition from (often subsidised) packaging producers in low-cost manufacturing locations, as well as the growing trend of multinational consumer goods producers to import goods from central manufacturing facilities outside of the country. In addition, multinational producers are also said to be exerting significant downward pressure on packaging prices. The trend towards e-auctions has been noted in the country, with packaging companies forced to participate if they wish to remain on lists approved suppliers. On the other hand, Greek packaging materials are exported to the Balkan countries, the Middle East and North Africa. Moreover, several Greek companies have established manufacturing facilities in the Balkans which is a fast expanding market area. Greek packaging industry has realized that innovation and good manufacturing practices are the strong weapons to overcome the competition from the low cost labour manufacturing countries. For that purpose, the Association of the Greek Manufacturers of Packaging and Materials (AGMPM) is strongly promoting activities related to innovation. The workshop on printing technology for RFID labeling. Seminar on efficient packaging waste management. Seminar on Sustainable packaging innovation. The major 2009 packaging events in Greece are the two Exhibitions: Expo Pack 2009 and Graphica Expo 2009 (info@graphicaexpo.gr | www.graphicaexpo.gr ) which take part co currently on 29/5-01/6 in the new Athens Metropolitan Expo Centre.